The Siberian iris prefers moist soil and can be grown successfully along borders of ponds or streams. The grass-like foliage resembles the popular bearded iris, but is considerably smaller with blades measuring a mere 1/2 inch in width. Height ranges from 12-inch miniatures to towering 3 1/2-foot varieties. The color ranges from traditional bluish-purple to pink, white and yellow. This hardy perennial survives to zone 3 and returns each year in larger clumps. Select a location for your iris that receives 6 to 8 hours of direct sunlight a day. Although Siberian iris tolerates light shade, blooming is inhibited in shady areas. 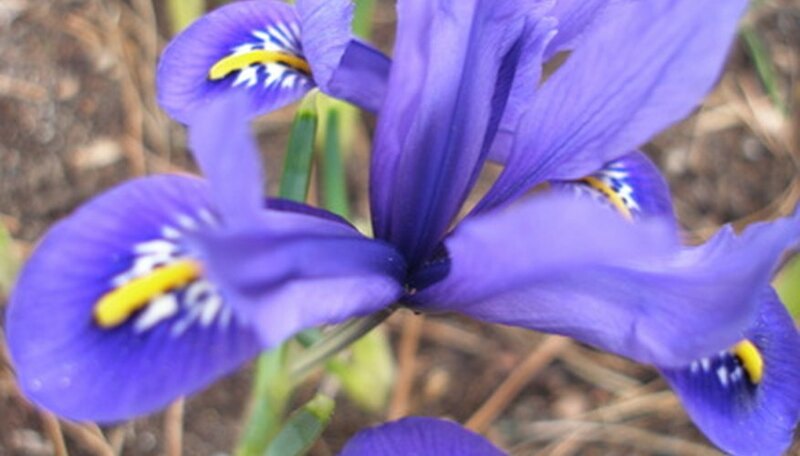 Prepare a bed for Siberian iris by tilling or digging to a depth of 8 to 10 inches. Add 3 to 4 inches of well-rotted manure or compost to the soil and work in well. This improves texture, promotes drainage and provides a source of slow-release nutrients for growing plants. Plant iris rhizomes in midsummer in northern gardens and in late summer or early fall in southern gardens to allow roots to become established before cool weather returns. Place rhizomes with the roots downward so the junction where the foliage joins the roots rests at the soil level. Cover the rhizome with 1 inch of soil and firm down with your hands. Arrange in groups of three, five or seven spaced 4 inches apart to create a natural appearance. Allow 12 to 14 inches between groups. Water to moisten the soil to the root level and keep soil moist. Deep watering once a week with supplemental watering during dry spells keeps soil moist. Fertilize with 5-10-10 fertilizer in spring before blooms appear. Fertilize in fall with bone meal or bulb fertilizer following the recommended application rate on the container. Trim foliage back to the ground level once it is killed by frost and mulch with a 2- to 3-inch layer of leaves or hay to protect from harsh winter weather. Remove mulch in spring when new growth appears. Lift and divide rhizomes when iris become overcrowded or blooms decrease. Typically, Siberian iris require division in five to six years.